Don't miss Bullz-Eye's interview with "Surveillance" star Bill Pullman! It’s been fifteen years since we last saw the words “directed by Jennifer Lynch” appearing on a film, and since Lynch’s last effort, “Boxing Helena,” was critically slaughtered, you’d think the two events were connected. They are not, as it happens, but even if they were, the creative success of her new film, “Surveillance,” is just about enough to forgive her of any and all previous transgressions. Bullz-Eye spoke to Lynch about how “Surveillance” - which opens in theaters on June 26th as well as on Video On Demand - can be a difficult viewing experience at times, asked how she came to write the “Twin Peaks” spin-off book, “The Secret Diary of Laura Palmer” (it’s a little more complicated than just being the daughter of the co-creator), and found out how she feels about “Boxing Helena” these days. Bullz-Eye: Hey Jennifer, how are you? JL: Good. How about yourself? BE: I’m doing great. It’s pleasure to speak with you. I’ve been a fan of yours since you wrote “The Secret Diary of Laura Palmer”. JL: (Laughs)Oh, you rule! So we’re old buddies! BE: Absolutely. I was a full-fledged “Twin Peaks” freak. I still have my copy of “Dale Cooper: My Life, My Tapes” around here, too. "The beauty of a creepy story, to me, is that maybe you think you shouldn’t be laughing, or you think you shouldn’t be enjoying it as much, but you keep going." BE: Well I watched “Surveillance,” and I was really, really impressed by it. I hadn’t heard a whole lot about it going in except for who was in it. But I was really enthralled…and I think it was in a good way most of the time. JL: (Laughs) Right on, right on. Well, you know, I’ll take “most of the time.” If that’s what you’ll give me I’ll take it. BE: Well, it’s one of those where, at some points, I almost felt bad watching it. JL: Well, that’s good, right? I mean, hopefully, there were certain moments of the Laura Palmer diary where you felt sort of bad reading. JL: The beauty of a creepy story, to me, is that maybe you think you shouldn’t be laughing, or you think you shouldn’t be enjoying it as much, but you keep going. BE: I don’t know if it’s an obvious answer or not, but…why was the long delay between films for you? JL: I had a baby, and I raised her on my own. She’s 13 now; she’ll be 14 in September. I also had three spinal surgeries, and I got sober. BE: Those are all really good reasons. JL: Yeah, you add them all up, and that’s about 15 years. BE: So what was it about “Surveillance” that made you decide to get back in the game? JL: It was the first thing I had written that I really fell in love with and wanted to see to fruition. Writing was my companion and stories were my companion when I was bedridden and didn’t think I was going to walk again and all of that treacherous stuff. And, you know, stories are how you can comfort a child. It’s certainly how I comforted my daughter, in good and bad times. So I think this one struck me because I was inspired by my daughter to remember the wisdom that children have and the clarity of thought. I had seen enough other films in my own absence from film, and even before that, that thrilled me or didn’t thrill me enough. There was one story I hadn’t seen yet and I wanted to tell it. and that was this one. BE: When you were writing the character of Stephanie, were you thinking in terms of your daughter when you were writing her scenes? JL: Yes, completely. My daughter and a little bit of myself. I was that kid in the backseat. BE: They are fantastic, and I figured that, if you had gone out on a limb and put comedians in a film that was certainly not what you would call a funny film, you had your reasons. And they played really well. JL: Yeah, I mean, I think that laughter is very close to terror and horror. Maybe that’s just me, but that sort of all-over rush that happens when you are either laughing or terrified or weeping…? I think that comedians, in and of themselves, make other people laugh because they aren’t necessarily the happiest people in the world. So they know a lot about dark things. Both French and Cheri have really made a lot of us laugh, and each of them are such incredible people and incredible performers. I hope to work with them again because I think, even in this case, I didn’t get to use them to the best of their abilities. BE: Well, I think certainly French was very well-utilized with his character. JL: He’s awesome. You would say “here, I want you to do this and this,” and he goes, “Okay.” He goes balls to the walls, no questions asked. He improvised that snow-angels line, and I thought I was going to wet myself on set, so I was pretty thrilled about that. BE: So I’m guessing the National Police Association is not necessarily a fan of the film…? JL: Well, you know, what’s weird is that about…God, two years ago, I met a man who was both a tattoo artist and a narcotics officer. He gave me a very large tattoo and he saw the film. I don’t know what took me so long, but in the middle of him viewing the film, I looked over at him and thought, “I’m showing this to a police officer. You idiot!” Afterwards, he turned to me and he said, “I know those cops.” And that scared me even more. I’m glad I didn’t know that beforehand. What it is is not necessarily a comment about the police force, more as a confessional of, “What would happen to me if I were left alone on a quiet, two lane highway with a gun and power?” You know…? I think that being bored with a gun is a very dangerous situation. BE: It’s just very disconcerting because it really is your worst nightmare of what a cop would do if they didn’t want to use their power with great responsibility. JL: Exactly, right. So why not explore the worst nightmare, do you know what I mean? BE: Not that there is any family history of exploring nightmares. JL: No! (Laughs) But, again, it’s so funny: my father is so jolly, and I live a really happy life. I think that’s why all this interest in the darker things comes up: because I’m curious about things I don’t live in. My experience with police officers, knock wood, has only been very positive. They are quite helpful, and I love the police force. I want to go on record as saying that. (Laughs) But it does occur to me that…what’s the phrase?...power corrupts, and absolute power corrupts absolutely. JL: And when something goes bad, sometimes it’s funny. BE: With Bill Pullman’s performance…towards the end of the film, I can’t imagine you told him to reign it in at any point, because he just went nuts. JL: I really said, “I want you to go for it.” You know, I said, “Think of Spinal Tap, go to eleven.” He and Julia, they both gave me such trust. There could have been moments that could have gone terribly wrong for them as actors and as characters. I feel really fortunate that they trusted me enough to do what they did. Bill, you know, he loaded his double-barrel shotgun and he fired that thing again and again and again. I’m forever indebted to him for that. BE: One more about “Surveillance,” then I want to ask a couple of things about other stuff, but…have you had to endure comparisons to “Natural Born Killers”? It’s certainly not an exact comparison, but I can see where people might make the comparison. JL: You’re the first. How about that? BE: But what can you do? BE: A friend of mine would kill me if I didn’t ask you about your experiences directing the New Model Army video, “Living in the Rose”. JL: Oh, God, it was awesome. I was just talking to somebody about that the other day, because I’m looking for work. They were asking about videos and commercials I have directed, and I said “Well, I think ‘Living in the Rose’ is on YouTube.” I saw it again a few weeks ago, and was, like, “Wow, God, that was a good time.” Look how long ago that was as far as effects go, and where my brain was. But what an amazing group of people. A truly amazing group of people. BE: Yeah, my buddy Jeff Pierce turned me on to New Model Army. They’re great. JL: Aren’t they awesome? They’re incredible, and they’re totally underrated. 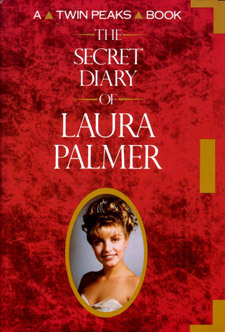 BE: Okay, you sounded like you had a story to tell about “The Secret Diary of Laura Palmer” a minute ago. JL: Well, apparently, I got more fan mail from male prison inmates and thirteen-year-old girls than anyone ever had at Simon & Schuster. (Laughs) I thought that was a nice commentary on the book. It went well if you got the thirteen-year-old girl and the male prison inmates, you know. You get that, the book should do well. BE: What other demographics do you need, really? JL: Exactly. That’s it. I mean, that’s what “Harry Potter” has, right? BE: How much leeway did you have with writing the diaries? Did your dad just tell you to go nuts? And how did you get to write them in the first place? JL: What happened was, when I was about twelve years old, my father asked me if I had any secret wishes. I remember being really quiet for minute and then saying, “Yeah, I wish I could find another girl’s diary when I come home from school, and find out if she thought the same things I did and was afraid of the same things I am and had the same friends and the same issues.” That sort of must have ruminated with him, because when “Twin Peaks” came along, he called me one day and said, “I’d like you to write Laura’s diary.” And I said, “Great!” So he called me in to a room with Mark Frost, and he told me who the killer was. He said, “Now, Jenno, you’re one of three air-breathing mammals who know who the killer is. Be careful. Now go write the book.” And that was it, you know? I had really free reign. I just needed to make sure that certain events were documented, but I could go wherever I wanted in Laura’s mind. So I was able to put a little of myself and a little imagination in there and have some fun. BE: I actually went to see your last film, “Boxing Helena,” on the day my nephew was born, so I have fond memories of the film that I immediately associate with that. JL: Oh, bless your heart. I hope he’s a good kid. BE: He is. And I think I still have my ticket stub somewhere around here. How do you feel about the film now? I mean, it certainly suffered through plenty of critical bashing in its time. "My father and I watch ('Eraserhead'), and all we do is laugh. It was Disneyland everyday on the set. That’s when I fell in love with film." JL: Yeah, I mean, for a long time, I couldn’t look at it. But now I find it as something precious. When you finish something and you let it out there, it is completely out of your control. You’ve done what you’ve done, you haven’t done what you haven’t done, and now you are up for judgment. People can be all kinds of ruthless and they can be all kinds of wonderful. The joy in what I do is in the doing of it. And then there is the part where people are either going to see what I’ve offered and liked it or they are going to see what I’ve offered and wish they hadn’t. So I think it’s the best film I could have made when I was that age. It’s the best script I could have written. It certainly would be different if I made it today. But I wouldn’t change a thing, because it has brought me to where I am now and I am very grateful. BE: Having seen your IMDb page, I have to ask: does it mess a little kid up to be in “Eraserhead”? JL: (Laughs) Are you kidding? It’s the greatest thing in the world! Again, it may seem like a dark film, but my father and I watch it, and all we do is laugh. It was Disneyland everyday on the set. That’s when I fell in love with film. Well, maybe you should ask the people closest to me. Maybe I can’t objectively answer that question. I would also call “Surveillance” a romantic comedy, so I don’t know. (Laughs) Maybe I am a little messed up. I don’t know what to say, Will! BE: Well, I will keep you on schedule, but I’m looking forward to seeing “Hisss” when that’s released. JL: Oh, right on! The trailer is on YouTube now. We will see what happens on that. It’s in post-production; I’m looking forward to it. BE: Excellent. Well, it’s been a pleasure talking to you, Jennifer. Thank you very much. JL: Thank you so much, I appreciate it!